At UMAe loyalty to the show is important to us. With this programme by staying loyal to us we offer you a way to purchase a lower priced ticket. Loyalty membership will also enable you to discounts against product purchases made on the UMAe website and any of its affiliated websites. Important: when registering for the Direct Debit or Future Pay ( Continuous payment authority CPA) to pay for the loyalty card, the shopping basket will show as £0.00. Please do not be concerned by this, the £10 fee has been transferred to the Direct Debit or Future Pay ( Continuous payment authority CPA) system and your payment will be taken via Direct Debit or Future Pay ( Continuous payment authority CPA) aapproximately 7 days after completion of the form. You will receive a confirmation of your Direct Debit or Future Pay ( Continuous payment authority CPA) via email for your records. Only 1 discounted ticket may be purchased per loyalty card holder. Once registered, you will receive your unique ref number, as this is an online system you will not receive a physical card unless you request one. This will be available for collection at registration on the days of the show and will not be mailed out. Any request for a lost card will be subject to a fee of £10 plus postage. 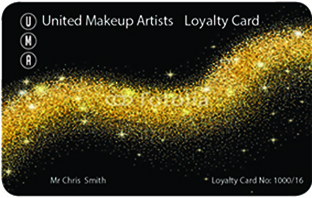 To qualify for a loyalty card you must be employed in one of the following groups: Makeup Artists, Fx Artist, Sculptors, Tutors, Hair Dressers, Wig Makers / Dressers, Mold makers, Stylists, or be a student studying in one or more of these areas. A separate account / login must be created within the UMAe website for each loyalty member. Only one discounted ticket may be purchased per loyalty card member. A Direct Debit or Future Pay (Continuous payment authority CPA) for £10 per year must be completed and submitted for each loyalty card ordered. This Direct Debit or Future Pay (Continuous payment authority CPA) must remain in place for 24 months. Any cancellation of the direct debit or Future Pay (Continuous payment authority CPA) within the 24 month’s period will result in the full prices being charged for the difference on any discounted purchases logged. This will apply to all items purchased through the UMAe website and to the Loyalty Card Ticket discount (which will then be charged at Full Standard admission ticket rate on the day of the show). Subscription cancellation is required in the form of an email and, to validate all purchases made using the Loyalty Card during the 24 month period, may not be submitted before the 25 month term of subscription has been passed. The email address for subscription cancellation can be found by clicking here. Please note United Makeup Artists Expo reserve the right to withdraw membership at any time due to abuse of its benefits. All terms and conditions are subject to change without notice.